Not in an advertising sense, "missing out" on pointless features. 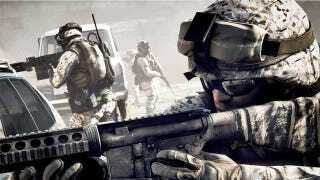 You will quite literally be missing out on some games, as EA has revealed that come 2012 a whole range of titles using DICE's Frostbite 2 engine - the one powering games such as Battlefield 3 - will need a 64-bit operating system to even run. "We'll have Frostbite-powered games in 2013 that will _require_ a 64-bit OS," Frostbite 2 dev Johan Andersson said yesterday on Twitter. "If you are on 32-bit, great opportunity to upgrade to Windows 8." If you've already got a 64-bit system and a 64-bit operating system, nothing to see here! But a lot of people don't. Indeed, Steam's latest user survey indicates that only 53% of gamers are running a 64-bit operating system. That's a lot of people who will need to buy at least a new copy of Windows, if not a new CPU, if they want to keep playing DICE's (and many of EA's) games.